Don't worry, this column isn't going all John Cena and disappearing. The Instagram train never stops, brother. This week, there's been more talk of Roman Reigns' push - complaints, inevitably - with some insight into the company's booking decisions coming courtesy of Dave Meltzer. Sadly, for WWE, he's not Daniel Bryan and he never will be, no matter how much they appear to be screwing him over. Meanwhile, the actual Daniel Bryan is widely expected to sign a new contract with WWE, despite rumours to the contrary. They'd be mad to let such a popular asset go, after all. Elsewhere, there's more talk of Dean Ambrose's impending return, news that Brock Lesnar won't defend the IC belt on Money In The Bank and confirmation both of Kevin Owens' new contract extension and the signing of the remaining two Four Horsewomen of MMA. There's a big four-on-four match coming soon, isn't there? 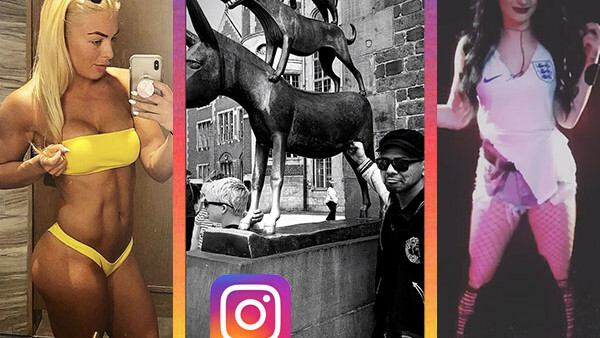 And through it all, the stars took to social media to show off what happens when you send superstars to Europe on tour and peel back the curtain on their real lives, workouts and endorsement deals.